Putting up everything into a proper system is something which is very difficult. The success of an ERP depends on the manpower that you have been holding in your organization. ERP will help you in centralizing all your systems and make it easily accessible to everyone at any possible time and location. There are systems for every process be it HR, production, accounts etc. and it’s important that these systems interact with each other. ERP is used by most parts of the business including the critical one. Therefore, it is important that the system needs to be available at all times. But software’s come with errors. As these ERP are cloud based they are available to the users very easily. As they are based in the premises there is always a gap between the error that is being resolved by the software provider and the software update will be implemented on the client side. This delay can be days or weeks. The ERP system has a wide functionality where the regular enhancements can be made available. Most of the regular businesses like accessing such enhancements at the earliest. These enhancements are available on an immediate basis. It can play a contrast effect with the on-premise solutions which requires some planning and involve a considerable disruption and expense. Due to these reasons the systems rarely run on the latest versions wherein the users cannot take the advantage of the enhancements available by the software supplier. It so happens that there many of the employees are working out of the office and they would be requiring access to the office data. This can be possible due to the cloud ERP. It helps them to access the data that they require in a secured manner anytime and anywhere. It is a fundamental facility provided by the cloud ERP solution. There are many businesses which have a new or a remote setup. The locations of these offices can be located anywhere. For such setups you need a cloud ERP solution which has a quick functionality, which is cheap and also reliable. A cloud based ERP is the best solution they have as the only thing they need for accessing is internet. Most of the businesses try to predict the cost of the ERP solution over its lifetime as it is very important. If a cloud based ERP is used the costs are generally known. Generally it is the price of per user plus the cost of using the system. The on-premise solution costs can be unpredictable ones. The time taken for an upgrade, what other upgrades would be required and the time and cost taken for these upgrades are all unpredictable. There can be various other reasons and it may vary from an organization to organization. 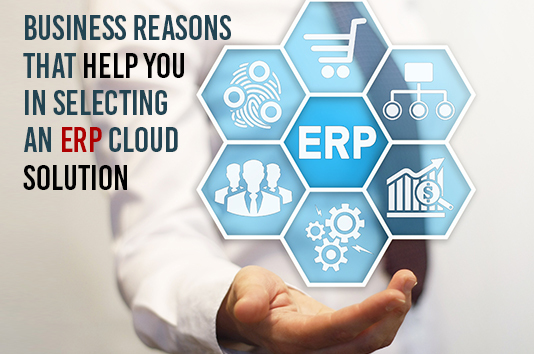 If you have some valid business reasons then you should be implementing the cloud ERP solution which will help in giving your business a boost and take you up to a new level.